Mile High United Way (MHUW) started over 125 years ago as the first United Way in the United States, with a mission to unite people, ideas, and resources to advance the common good. MHUW built a new facility in a Denver neighborhood that was in need of social services and the economic development that comes with them. 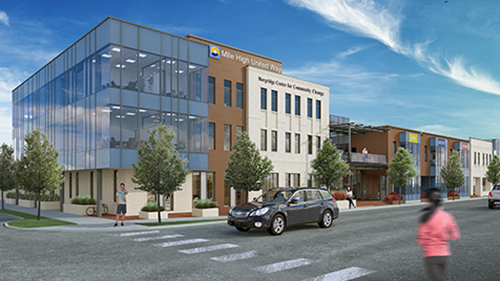 Twenty-five years after MHUW moved its facilities to an economically distressed Denver neighborhood, that surrounding area has experienced significant redevelopment. MHUW sought to continue this vision by sparking early redevelopment in the gateway of Denver’s Curtis Park neighborhood, the Arapahoe Square Development, and downtown Denver. The new facility allowed MHUW to establish a presence and play a vital role in local economic development and revitalization, bringing corporate community, donors, and policymakers to that neighborhood. At the same time, MHUW expanded its community services, increasing access for the organization’s many program partners and direct services beneficiaries. The new space allowed Mile High United Way to open “Café United”, a social enterprise managed by Work Options for Women, designed to engage homeless and unemployed women to help them gain the skills and confidence they need to enter the workforce. MHUW will also expand many existing services, including its 2-1-1 call center, a referral resource for essential human services. The organization continues to provide direct capacity building, training, and technical assistance to the community, as well as Individual Development Account (IDAs) designed to build financial assets. Native American Bank participated in the Mile High United Way projects as a bridge loan lender, contributing gap financing to a catalytic project that will create impact in the Bank’s own community. Through the loan, the bank was able to generate income to support the sustainability of its mission and operations. The bank was also able to establish a relationship with United Way that will further both institutions’ efforts to impact the community.